David Haye is buzzing, anticipating as he is, an exciting 2018. The former cruiserweight and WBA heavyweight ruler has released a video on social media, showing us the scar that is the result of his biceps operation. As fans know, it was this injury that forced Haye to postpone his December return with Tony Bellew, but the sequel is now back on for May. And Haye – who says how 2018 “is going to be the most exciting year of my life,” but at the same time this year is “potentially my last year as a competitive athlete so I want to go out with some big fireworks” – is promising action in the coming months. The 37 year old says he is healing up well and that he is currently at “40 percent” with regards to his left arm. Haye, it goes without saying, simply has to win the May 5 return with Bellew (who of course shocked him with that 11th round stoppage win back in March of 2017; Haye’s torn Achilles proving a big factor in the bout) – and if he fails to do so his career will certainly be over. But can a fully fit Haye get the job done against Bellew, as most fans felt would be the case almost a year ago? And if Haye does get the revenge win, what then for the two-weight champ? All the current world champions appear to have fights either scheduled or close to being scheduled, so Haye may find it hard getting what he wants: a world title shot and with it a chance to exit the sport as a champion. Then again, it is conceivable that reigning WBC king Deontay Wilder could fight Haye, if a deal for Wilder and Anthony Joshua cannot be worked out. Haye against Joshua could be a big attraction here in the UK, especially if Haye does a number on Bellew and looks good doing it. But Joshua, it seems, has bigger fish to fry. Haye may have missed out on the all-British battle he said a year or so ago that he could win in quick fashion. Right now though, Haye should be thinking about and focusing on Bellew and no other fighter. 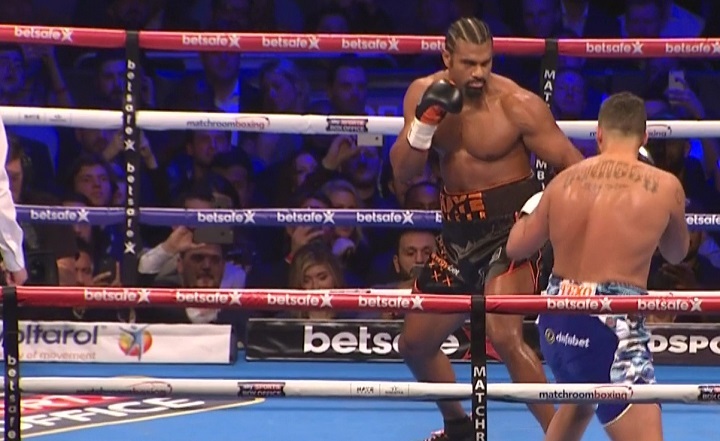 Has Haye got one last great performance in him?